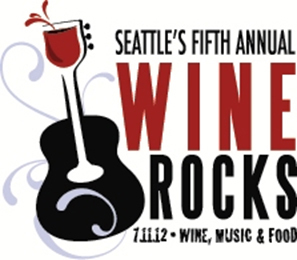 Rock Me All Night Long - Win 2 tickets to Wine Rocks Seattle 2012! Have you procrastinated in obtaining your Wine Rocks 2012 tickets? Do you like free stuff? Well, then I have the contest for you. Sips & the City is giving away a pair of tickets to this year's Wine Rocks event, which (as I previously wrote about) is happening Wednesday July 11th, 2012. 1. Head on over to the Twittersphere and follow @WineRocksSEA. There are great updates posted about the event. 2. Stop by the Wine Rocks Seattle facebook page and give them a "like". You'll also find more information about the event here. 3. Leave a comment on this post. I had fun with this last year by having people pair their favorite type of wine and music. Do it again! Think of it like a food & wine pairing but with music & wine. Get creative! Please make sure to leave your full name so I can find you if you win. I'll randomly pick from all comments on Friday June 29th, 2012 at noon. Don't miss out on a chance to win tickets to what will surely be a fantastic event! So how did Wine Rocks come to be? Founder Jen Doak states, “I created Wine Rocks in 2008 as an open house event for Gibson Guitars to bring publicity to their showroom. I suggested that they bring in a few local winery owners who also love strumming their guitars. The concept was a huge hit and Wine Rocks has grown every year since.” And boy has it ever. I've had the privilege of attending the past two year's events and each year it grew and changed venues to larger spaces. I can't wait to be down on the waterfront on a (hopefully) beautiful Seattle summer evening. To date, participating wineries include: Animale Winery, Baer Winery, Barons V, Barrage Cellars, Celaeno Winery, Chatter Creek Winery, Corvus Cellars, DiStefano Winery, Dusted Valley Vintners, Eye of the Needle, Fidelitas Wines, Fjellene Cellars & Vineyard, Gifford Hirlinger, Glencorrie Winery, Gorman Winery, Guardian Cellars, Hightower Cellars, Jones of Washington, Kiona Vineyard & Winery, Long Shadows, Magnificant Wine Co., Mark Ryan Winery, Michael Florentino Cellars, Pontin del Roza Winery, Purple Star, Renegade Wine Co., Robert Ramsay Cellars, Smasne Cellars, Terra Blanca, Treveri Cellars, Walter Dacon Wines and Waters Winery. And you’ve got the recipe for another great Peha Promotions event! This year’s Wine Rocks event benefits The Giving Grapes Foundation, a 501c3 organization that assists local charities who provide financial assistance to service industry professionals who have to take time off work due to injury or illness. BUT WAIT, THERE’S MORE! Sips & the City will be giving away a pair of tickets to this awesome event! Be on the lookout for the post detailing the giveaway (coming soon)! What are you waiting for? Get your tickets here and I’ll see you on the Pier for Wine Rocks 2012!